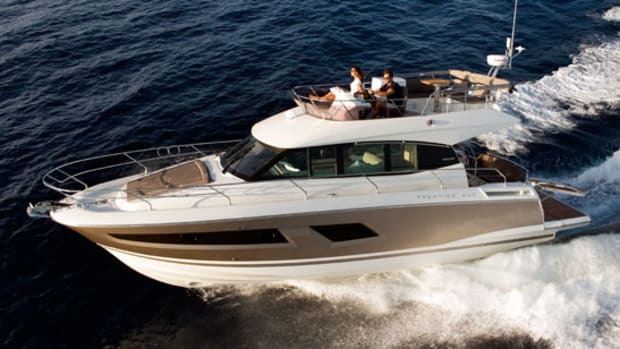 Thanks to a rigid production process, the Prestige 550 delivers a lot of boat for the money. 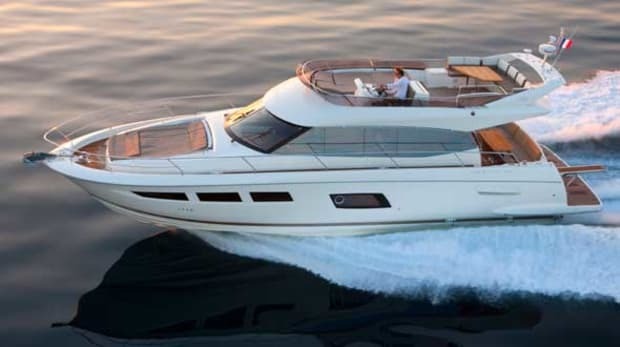 As one of the world’s biggest boatbuilders, Jeanneau has a variety of product lines. Foremost are the immensely popular sailboats, which fill harbors around the world. Then there are the capable little motor cruisers, and the distinctively French pêches-promenades, or day-fishing boats, which seem to surround their native shores in the summer months like a defensive fleet. 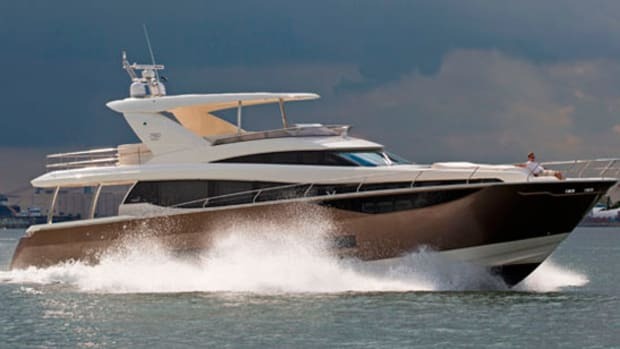 And at the other end of the scale come the Prestige motor yachts, a range of hardtop and flying-bridge boats from 39 feet to 62 feet with sleeker looks, more luxurious interiors, and higher performance than their smaller and more workmanlike siblings. Sleek; check. More luxurious; check. Better performance; check. 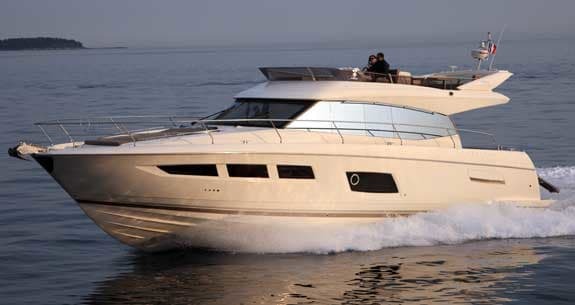 But Jeanneau makes no unrealistic claims about its Prestige line. 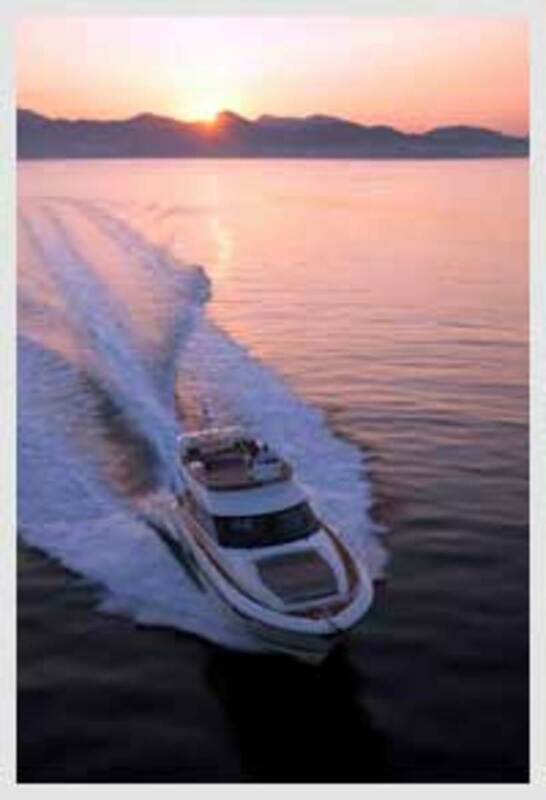 Fairline can sleep easy. 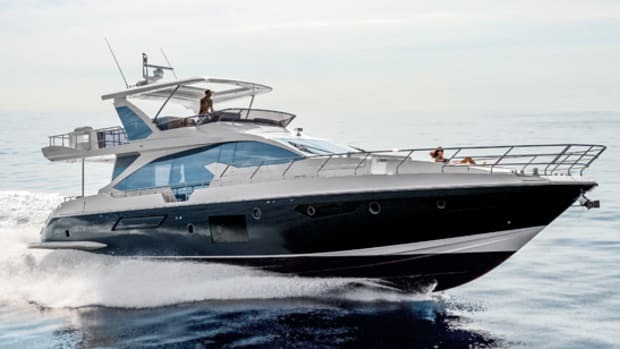 Riva’s craftsmen need not look over their shoulders, and the managers at Azimut need not be worried over a dip in sales caused by a sudden French invasion. 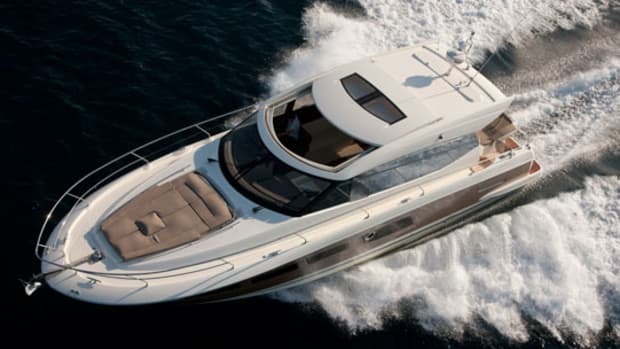 As a high-volume producer, what Jeanneau can do more effectively than any of these supposed rivals is to build boats to a price. Put another way, Prestige sets out to give you a lot of boat for your buck. The flying-bridge 550 is an excellent example of how this is done. A substantial cruising yacht with high topsides and a tall superstructure, the 550 may have plenty of internal volume, but its designers have not attempted to cram it with accommodations in a misguided attempt to add value. Instead, they celebrate the space. The windows are huge—both above and below. 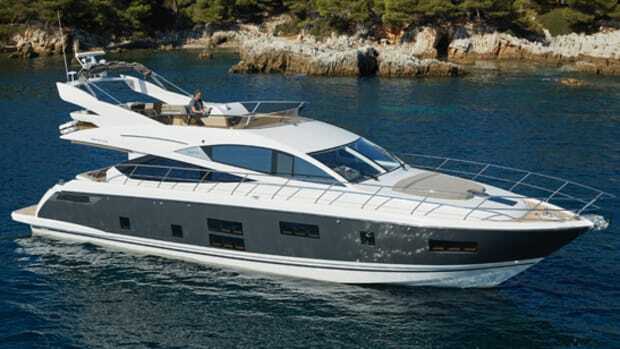 The master cabin is spread across all 15 feet 8 inches of beam, and the VIP forward feels almost as big. Headroom is well over 6 feet everywhere—and over 6 feet 6 inches in some places—and the master suite has a separate dressing room as well as a breakfast dinette. The VIP has a clever queen berth that scissors apart into two twins that border the hullsides. There is space for a full-size washer-dryer under the stairs. Stowage spaces are big and numerous. The guest twin is on the port side, sharing the forward head compartment, and with no attempt at a third head or a fourth cabin, all these spaces can breathe. They all feel big. Actually, though, there is a fourth cabin. It’s in the stern, intended for the captain, and has its own shower and toilet plus a large window in the transom—and it’s really not bad. Up on the main deck this impression of space is even more marked, and even more celebrated by the light flooding in through those huge saloon windows. No doubt it helped that we were testing in the sunny South of France, but you could argue that if you cruise in gloomy places you need big windows even more. 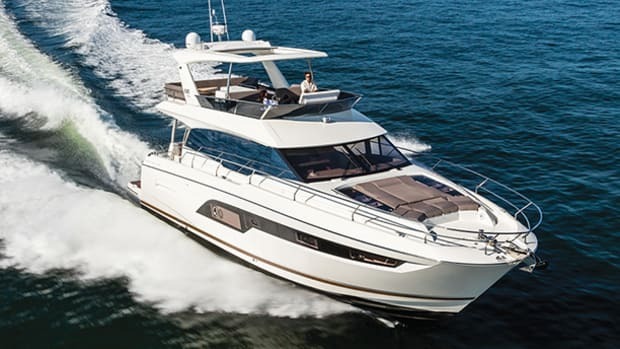 Like her smaller sister, the 500 Fly, the 550 has its main deck focused on the raised central section, with a sofa and folding dining table benefiting from the view. The galley is aft on the port side, serving both saloon and cockpit, with the master cabin companionway abaft the lounge to starboard. Unlike on the ‘S’ models, the 550 has no sunroof. 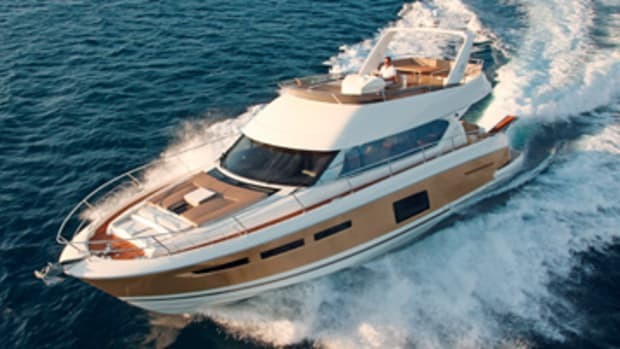 But in its place is a huge flying bridge, with plenty of seating and sunbathing space for everyone onboard, a useful bar area with sink, grill, and fridge, and a two-seat bench at the upper helm. Behind the scenes, we found the 550’s fit-out to be tidy and competent, but pretty basic. The engine room was reasonably well executed, with good access through the cockpit sole. Interestingly, jackshafts between the engines and the Zeus pods pass beneath the crew cabin—and with the tender housed on the optional hydraulic swim platform, there is no garage taking up valuable space in the stern. Inside the boat, as you might expect, economies have been made. It’s true that the stainless steel and leather trim are nicely executed, but some locker doors (by no means all) turn out to be simple removable panels, to save on hinges. The anchor supplied might be a 70-pound Delta, but inside there is considerably more plastic than aboard the average Ferretti or Grand Banks, more veneer and less hardwood. Our 550 could boast plenty of teak decking, and its cockpit and flying-bridge tables were generous slabs of solid teak, but there is also a limited choice of interior color schemes and only one choice of engines. Fortunately, that one choice features a pair of 600-horsepower 8.3-litre Cummins QSC diesels, coupled to Zeus pod drives. Constructed using resin infusion for optimum strength and light weight, the hull was designed specifically for this performance package, and it shows. 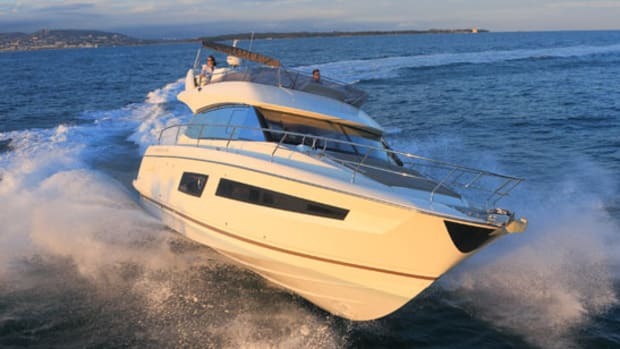 Accelerating to 25 knots in just 20 seconds, the 550 provides a zippy and fun ride, topping out at nearly 32 knots and cruising comfortably and economically in the low- to mid-20s. The designers clearly intended the 550 for use in a variety of sea states. Underway on flat water she runs most efficiently with a little downward tab, otherwise she rides too bow high. This made a difference, we discovered, of up to three knots at 2700 rpm, and it means that when you do want to lift the bow—in a following sea, for example—you can. All such considerations are handled effortlessly by the Zeus automatic trim system—as the company skipper said, you only need to engage manual control of the trim tabs in rough weather. Another aspect of the Zeus electronics package that caught my eye was the engaging little animated pictogram that shows you where the propeller thrust is actually being directed as you use the joystick. If you’re a traditional shafts-and-rudders man like me, you’ll probably find this is slightly too much information in a tight spot, but it’s an invaluable teaching aid. Helm ergonomics were perfectly adequate, especially below, where the seat slides fore and aft and the wheel can also be adjusted. Visibility proved extremely good. The 550 was a fun drive: a little stolid in its handling, but responsive to the helm and throttles. Cummins claims their QSC motors to be pretty quiet and sound levels did indeed prove to be commendably low, with nothing to be heard on the flying bridge but the swoosh of the hull through the water and the buzz of PWCs playing in our wake. It was a flat calm evening with no waves anywhere else, after all. 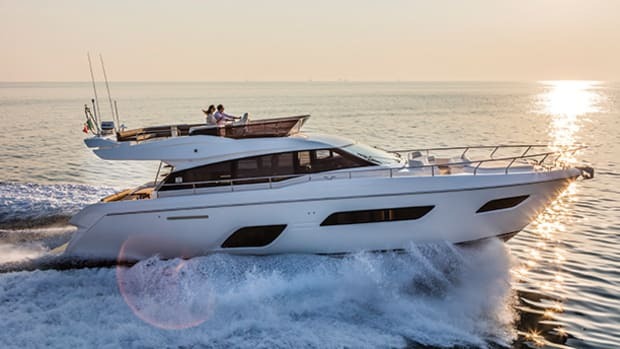 And under the prevailing conditions—still air and crystal-clear visibility, with the prospect of sundown aperitifs followed by a good Provençal meal overlooking the Mediterranean—the Prestige 550 seemed pretty near perfect. Noteworthy Options: Seakeeper stabilizer ($121,549), washer-dryer ($3,025), 61,000-Btu A/C ($47,760), hydraulic platform ($27,376), Zeus joystick in cockpit ($8,700). *Prices are subject to change.